Ota Fine Arts Singapore is delighted to present Cat Olympics: in memory of Torajiro, a solo exhibition by Japanese artist, Nobuaki Takekawa. Through his participation in the Singapore Biennale 2016 and previous solo exhibitions at the gallery in 2013 and 2016, Takekawa has established a familiarity with the local audience. His work has been exhibited internationally in China, France, Japan, Russia, Singapore and more. This exhibition, titled Cat Olympics: in memory of Torajiro, was first held in the gallery’s Shanghai space last year. Incorporating some new works, the show now travels to Singapore. Upon entry, one will see a mega sporting event held at 3 miniature model venues, including an opening ceremony stadium, an aquatic center and a gymnasium. 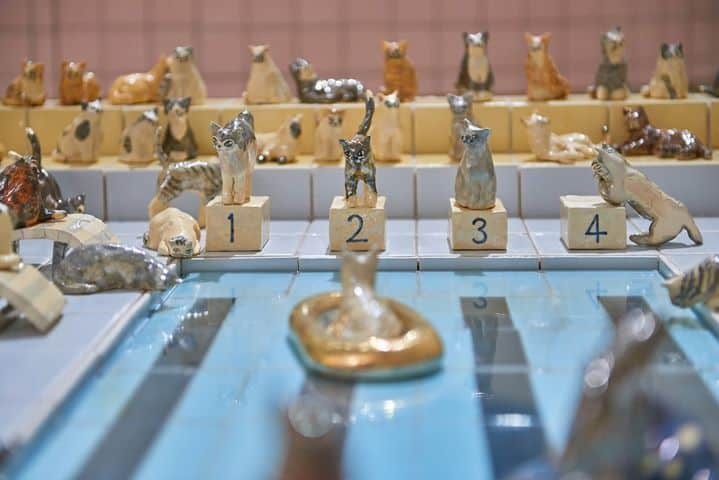 Hundreds of cat athletes, made out of ceramic, are engaged in various sporting activities. Besides the installation works, 10 monotypes on paper, cat-shaped protest signs and drawings on paper are also included in this exhibition. At first glance, one is welcomed by the lively and cheery atmosphere of the whimsical cat athletes. However, on closer observation, one realizes that the cat-shaped paper relief works have wooden stick handles attached to them – they are modelled after protest signs that activists use during demonstrations, with each cat claiming its own rights. Through his works, Takekawa directs us to ponder on various socio-historical issues. Cat Olympics: in memory of Torajiro creates an opportunity for viewers to look at the frenetic Olympics Games global event which happens every four years. The Olympic Games is a platform for the human race to challenge limits of its own, and creates unity as a global society. However, it also tends to reveal complex underlying issues. Takekawa reflects upon the Japanese government’s role in Tokyo being elected to host the 2020 Olympic Games. Simultaneously, Prime Minister Shinzo Abe has announced plans to revise areas of the country’s constitution. The artist points out that amidst the frenzy leading up to the Olympic Games, Prime Minister Abe pursues his political agenda. Takekawa remarks, “this is not a direct criticism to human society though,” leaving his viewers to ponder upon the implicit relationship between the excitement of the sports event and our fundamental political rights. The feature of cats in this exhibition is tightly connected and consistent with Takekawa’s artistic practice. Throughout his career, Takekawa has always selected animals and elements of nature (such as the sea and outer space) as a visual language to connect easily with his viewers, drawing them in with light-hearted and familiar objects and often leaving it open to their own interpretations. For this exhibition, Takekawa commemorates the anniversary of his beloved cat, Torajiro, who passed away in an accident a year ago. Cat Olympics: in memory of Torajiro embodies a miracle of unity, integration and universality under the complex rules of competition. Ota Fine Arts Singapore welcomes you to experience the latest expression by Nobuaki Takekawa.